Okay, so how do we get a feel for what your heart disease risk factor is? The answer is, go and get a lipid panel test done. Lipid is simply another name for fat. Your fat numbers can be determined through a simple blood test at your doctor’s office, a health fair, or the blood bank where you give blood. 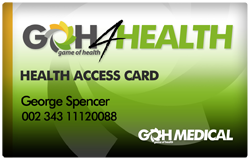 Not only will they provide you with your LDL, HDL and triglyceride numbers, but they will also give you your total cholesterol count. If we were to go to a highly active, agrarian (farming) society, we would find a clear connection between physical labor, healthy foods and healthy blood. Their diets would probably consist of highly complex carbohydrates, such as beans, whole grains, vegetables, and/or fruit. Their protein sources would be lean meats, like fowl, fish, wild rabbit, deer, squirrel, or free range cattle. As a result of their diet and highly active lifestyle, their HDL/LDL/ triglycerides numbers would probably come back around 70/70/70. With fat numbers like these, people rarely, if ever, die of heart disease or stroke. On the contrary, if we were to go to a sedentary or low-activity society, such as the United States, we would find a clear connection between low physical activity, unhealthy foods and unhealthy blood. Here at home, our diet consists of less complex carbohydrates. Foods are more refined and processed and contain an increased amount of saturated and trans fats. Our sources of protein are fattier meats such as highly marbled beef and pork. As a result, our HDL levels are low, and our LDL and triglycerides levels are high. As HDL levels drop below 60 in women and below 50 in men, we know that blood vessels are less protected and more at risk to develop plaque formation. When HDL levels drop below 50 in women and below 40 in men, we know that the HDL no longer has a protective value in the body. As HDL levels drop, LDL levels rise. As LDL levels move up from 70, the likelihood that fat will get stuck in blood vessel walls increases. Keeping our HDL level high is vital. 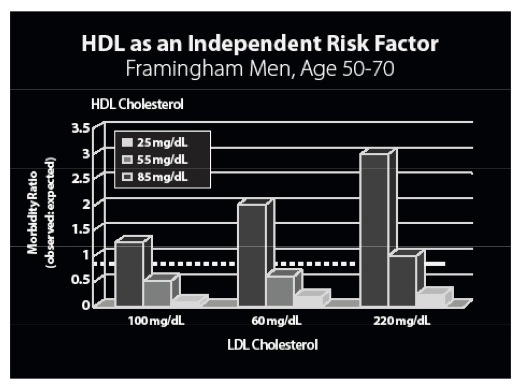 Studies like the one done on the Framingham Men (shown on the next page) reveal that even in the presence of high amounts of LDL, if HDL levels are high, the risk of death from heart attack or stroke is drastically lower. The medical industry has established two cutoff points at which they recommend medication. If a person has never had a heart attack or stroke, we prescribe cholesterol controlling medicine for an LDL level of 130. If a person has had a heart attack or stroke, we prescribe cholesterol controlling medicine for an LDL level over 100. Triglycerides are a little harder to figure out as their correlation with heart disease is not as clear. These fats are more variable and affected by many other factors, so we are less focused on them. However, if they rise over 150, they are considered too high, and treatment with a vitamin (niacin) or medication may be warranted. 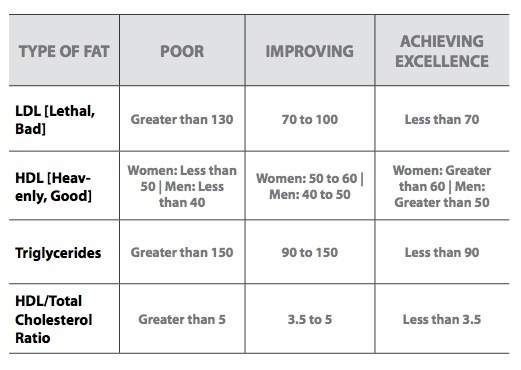 The ideal fat numbers are: LDL less than 70; HDL greater than 60 in women and greater than 50 in men; and a triglycerides level of less than 90. To get the Total Cholesterol count, we take the HDL + LDL + [triglycerides / 5]. Historically, a Total Cholesterol count below 200 has been considered healthy. However, because this number alone can sometimes be misleading, we use a ratio of the Total Cholesterol / HDL to get an accurate reading of our fat levels. This lets us know how many good guys (HDL) we have in relation to the bad guys (LDL). The Ideal ratio we aim for is less than 3.0. Any ratio greater than 5 is a major concern that may require intervention.